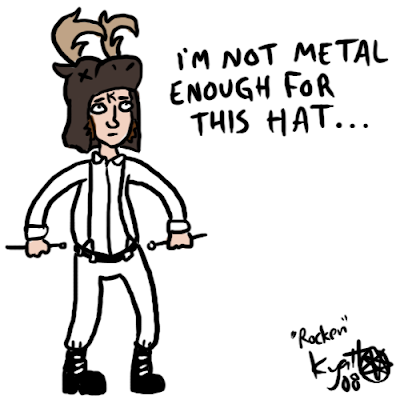 Today's drawing is of my Rock Band 2 character, Rocken Kyatt. He's pretty much a Clockwork Orange droog, except since there's no bowler in the game, I have an array of other black hats. Yesterday, I unlocked the ultimate metal outfit, which is made entirely of dead animals and spikes; more importantly, gave me a new hat. I think I'll be switching it soon.